Busy weeks. Lots of (outer) space. Well, first of all I have volunteered (and have been accepted) as part of the Media and Communication Team of the next Mars Analog Field Simulation of the Austrian Space Forum, that will take place in Morocco in februari of 2013. This means I have worked on putting together some of the press kit documents for the recent press conference for the mission that took place last week in Vienna, doing Skype-meetings with the team, being in Innsbruck for the upcoming dress rehearsal and finally being in Innsbruck for the first of the four week mission in februari 2013. I also plan to be writing mobile apps for ÖWF. Secondly, I was at the awesome #ILATweetup in Berlin last weekend. 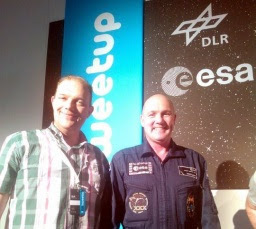 This was a tweetup event organised by ESA/DLR during the ILA Air Show, where participants where treated to a dense program of interesting talks, a tour of the Zero-G Airbus A-300 and a meet-and-greet with four astronauts, including André Kuipers. I was clearly not the only one taking pictures (and video) during that day.. Finally (for this blog post), I have been at the very first SpaceUp unconference event in Europe, which was at the Cosmodrome in Genk this weekend. Lots of familiar faces were there, and interesting space stuff. While en route to the second day I heard Jens Timmermans of the largest radio station in the Netherlands talking about Twitter trending topics and asking "What's your hashtag for today?". On a whim I texted that I was going to #SpaceUpEU and he almost immediately called me back, giving me some airtime to promote this awesome event on national radio (link to recorded Dutch audio), which was unexpected. So I have been keeping myself busy. Tomorrow will be "just an ordinary day at the office".